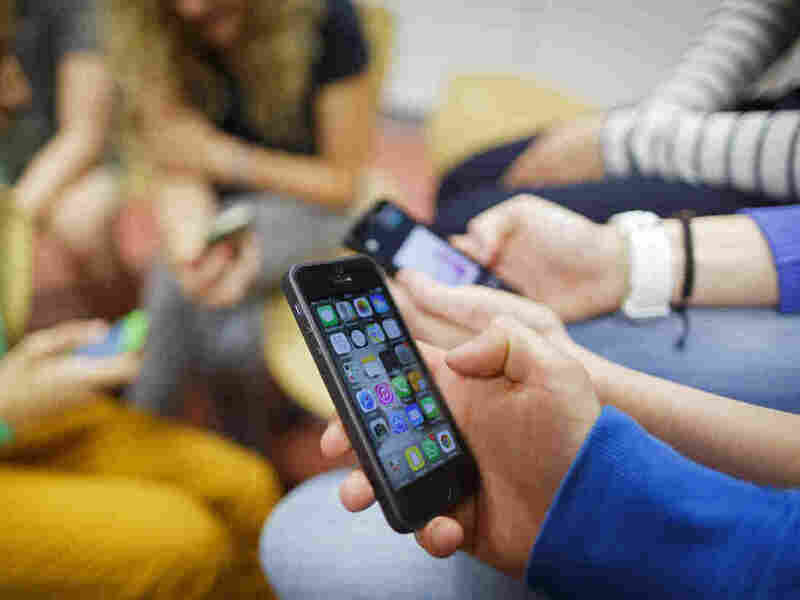 Teen Depression, Suicide Linked To Time Spent On Phones, Social Media This week on The Call-In, a new study suggests a link between electronic device use and depression among teens. NPR's Lulu Garcia-Navarro talks with Jean Twenge, one of the authors of that study. Researchers found a sudden increase in teens' symptoms of depression, suicide risk factors and suicide rates in 2012 — around the time when smartphones became popular, researcher Jean Twenge says. A new study found that teenagers are increasingly depressed, feel hopeless and are more likely to consider suicide. Researchers found a sudden increase in teens' symptoms of depression, suicide risk factors and suicide rates in 2012 — around the time when smartphones became popular, says Jean Twenge, one of the authors of the study. Twenge's research found that teens who spend five or more hours per day on their devices are 71 percent more likely to have one risk factor for suicide. And that's regardless of the content consumed. Whether teens are watching cat videos or looking at something more serious, the amount of screen time — not the specific content — goes hand in hand with the higher instances of depression. "It's an excessive amount of time spent on the device. So half an hour, an hour a day, that seemed to be the sweet spot for teen mental health in terms of electronic devices," Twenge says. "At two hours a day there was only a slightly elevated risk. And then three hours a day and beyond is where you saw the more pronounced increase in those who had at least one suicide risk factor." Twenge spoke with NPR's Lulu Garcia-Navarro about the dangers of excessive smartphone use among teenagers, how parents can manage their teens' social media usage and when is the best age for them to get smartphones. I think a great rule for both teens and adults is to try to keep your use at two hours a day or less. And then you put that phone down, and you spend the rest of your time on things that are better for mental health and happiness, like sleeping, seeing friends and family face to face, getting out and exercising. These are all things that are linked to better mental health. So if you use the phone to facilitate those things rather than stand in their way, that's a good way to go. The idea that they're under an increasing amount of academic pressure, and they're spending more and more time on schoolwork doesn't turn out to be true when you look at these large, nationally representative surveys. For example, there's a large survey of entering college students, so that's exactly the population you'd expect would feel a lot of pressure to have spent a lot of time on homework and extracurricular activities. Among that group, when they report on their last year in high school, homework time is about the same as it was in the '80s, and the time they spend on extracurricular activities is also about the same ... The other thing is, we also found that teens who spend more time on homework are actually less likely to be depressed. I think ideally, 14. Beginning of high school is a good age to aim for because there's some other data suggesting that the links between, for example, social media use and unhappiness are the strongest for 8th graders versus 10th or especially 12th graders. By the time they're at that age they're better able to handle the demands of social media. And some of the mental health trends are the most pronounced for the youngest teens, as well.